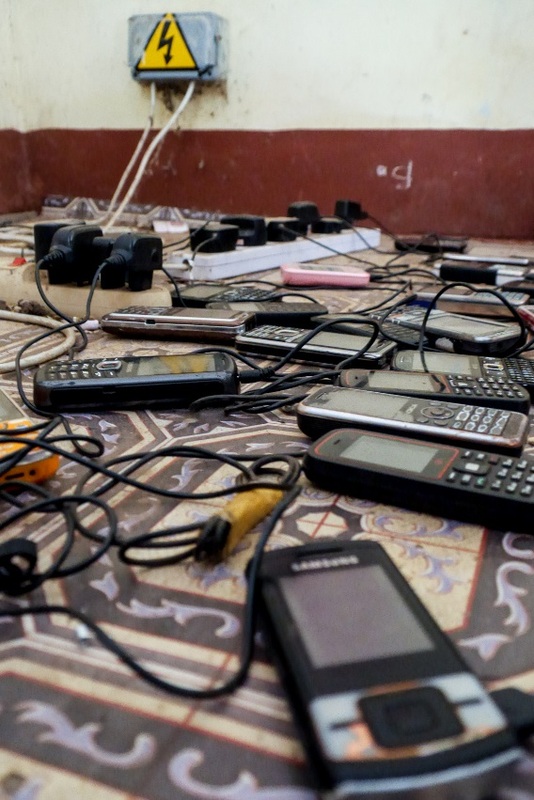 This post looks at some of data that we received and lessons the team learned over the experience of installing our remote monitoring kit in the Gambia. This is a sample of data which was measured and transmitted from the remote monitoring device installed in the Kudang School in the Gambia. This dataset represents the volume of solar energy captured alongside the volume of energy used over a period of three days. The current provided by the solar panels is shown by the orange line and the current drawn by the Inverter and the classroom lighting is designated by green and yellow lines respectively. The voltage over the battery is represented by the brown line and finally voltage over the whole system is shown by the blue line. What does the data show us? It can be seen that throughout the day the system receives a relatively large current ( approximately 2 Amps on average) from the solar panels and this energy will pass through the charge controller and goes on to charge the battery. However, throughout the day the inverter draws a consistent current (from 2 – 4 Amps) which is used by the school to power an enterprise project where they charge mobile phones for a small cost. It can also be seen that every night at approximately 17:00 the classroom lights are turned on for night classes. As previously mentioned this remote monitoring system allows us to see how close to capacity the system is running. This graph presents a system which is running over capacity and this is shown by the drop in system voltage at approximately 22:00 each night. This occurs because the charge controller, setup to protect the battery from over discharge as its voltage decreases, disconnects the battery from the system. What are the reasons for overuse? 2) It could mean that the system is now being used above the capacity in which it was intended for. In this case it would seem that the heavy inverter use through the day is pushing the system above capacity which means that the inverter is almost drawing all the current which the solar panels generate, meaning the battery is not given a sufficient chance to charge. In conclusion the Remote monitoring system has proven to be a helpful device which we aim to roll out in other locations as opportunities present themselves. Furthermore the experience gained from the deployment of our first device has given us many insights into potential areas where the devices can be improved for future versions such as two way communication or using local sim cards. The data gained from these devices is invaluable in the planning of future installations, fault-finding in existing installations and in the development of a model for sustainable energy in the developing world. We hope by this time next year to have a number of more robust and reliable second generation devices deployed in a range of different locations in order to further test our devices and most importantly to gain a better understanding of energy usage in the developing world.